Creating value is not just something you do behind a paywall. Creating value is something you do everywhere. Now that more and more newspapers realize that they have to add subscriptions to survive in the digital world, we also see the conflict inherent in the connected world between optimizing for eyeballs and optimizing for value. Anyone can copy/paste an article, but only a few can create one. If you want to convince people that they should pay for your content, you have to be the creator. But most newspapers are still trying to be reporters, basically parroting what other people are saying. Let me give you just one simple example, one that I see many times every single day. It illustrates the difference between those who produce unique value, and those who just copy/paste. 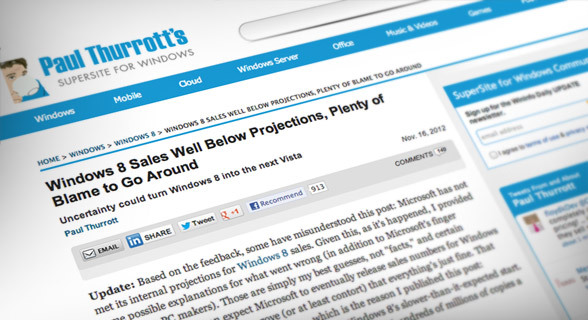 On November 16th, Paul Thurrott wrote about how Windows 8 sales were below projections, and provided his analysis of why that was. It's a good article, and it's one that he 'created'. A few days later, Wired's Alexandra Chang noticed it, thought it needed input from the big hardware players, and decided to do an interview. The result was a new article that starts off with Paul's story but then expands it into the extra information obtained by Wired. And as you can see in the screenshot below, Wired is careful to not only credit Paul's work, but also to make sure that their readers know what was added by Wired. Again, this is great journalism, in which they focus on creating and expanding a story. This is what we want. Creators augmenting the story of other creators. This is the essence of: "Do what you do best, link to the rest" as Jeff Jarvis likes to put it. But then it takes a turn for the worse. First we have The Next Web (TNW), who quotes from Wired's article and adds their own short opinion. In theory that's not bad, but it's one of those articles that a journalist can write in 2 minutes. This is similar to what the rest of us would post on G+ just to share something. TNW is just 'reporting'. They are not 'creating'. And, TNW only links to Wired's article, but not Paul's. Do you see how things are starting to erode? Of course, TNW has many readers, and one of them is a journalist for the Danish tech site, Version2. He notice it and decided to just copy/pasted the story from TNW by paraphrasing but adding nothing new, while translating it to Danish. There is value in the translation for the very few who don't understand English, but there is no value in the article itself. It's just a copy of someone else's hard work. Not only that, but Version2's article is not crediting Wired or Paul Thurrott, they credit TNW. 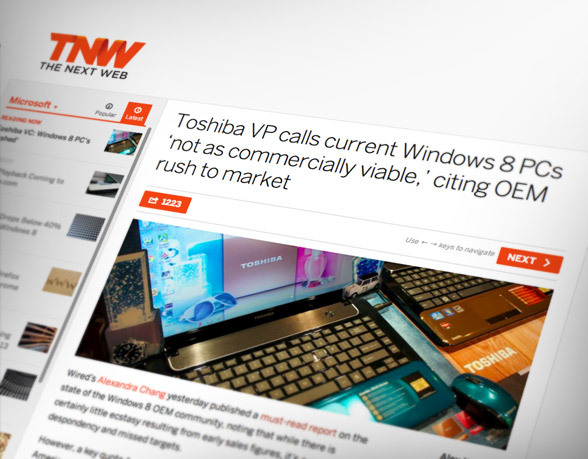 Version 2 even wrote that Toshiba's CEO spoke with TNW . Toshiba didn't tell TNW anything... They spoke with Wired. Did this journalist even read the original article? You might think that it stops here, but it doesn't. Now one of biggest newspapers in Denmark crossposts the story by copy/pasting it to their site (while again paraphrasing). Again, nothing new is added, and again they completely fail to link to the real source. Now the article only links to Version2. It doesn't mention Wired or Paul Thurrott in any way, and while it does mention The Next Web, it doesn't link to them. It can't get any worse than this. There is no value left, no context, no backstory, no nothing. You have been moved so far away from the original stories (where the real value is) that you have to be seriously committed to even find it. In the old print world, this is what you call being the 'bringer of news'. You take a story from one place and bring it to another. That's the business model of the print world. Anyone can copy/paste an article, but only a few can create one. So let me ask you: In this chain of events, which sources would you pay for? Would you pay for Paul Thurrott's site? Well, as a niche site it depends on your interests, but he does provide great analysis and insight, and, as far as I know, many people do buy the many offerings from Penton Group (the publishing group that owns Paul's site). Would you pay for Wired? Well... the article was good, and it's certainly interesting to hear what those executives had to say. But the real value, the analysis, wasn't there. You could use Paul's analysis by comparing it against your own projects. You can't do that with Wired's article. Wired's article was interesting, but less relevant. Another problem with Wired was that they weren't the ones who created the article. All they did was to call several executives and asked them to answer a few questions. That is good journalistic work, but any journalist could do that. What is it that makes Wired unique? This is the problem that any journalist is faced with. Because the old world was about being the bringer of news, journalists are taught to be faceless and neutral. This strategy works in a divided market, but in the connected world it makes you blend into the background. Don't get me wrong, I think Wired did a great job. I just cannot come up with a reason why it's worth paying for. It's too generalized. 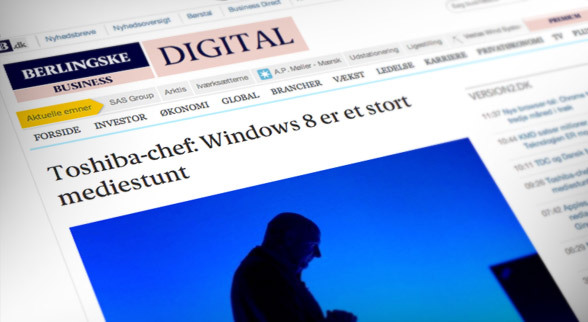 What about TNW, Version2, and Berlingske Business? ...the sites that just copy/pasted the story. Would you pay for those? Nah... why would you do that? The dilemma, of course, is that sites like TNW, Version2 and Berlingske are also producing good original stories of their own. They are not always copying others. They only do it for a certain percentage of their content to boost their page views. And it kind of works for The Next Web because, while short, they did add their own voice. It was more like sharing than republishing. TNW tried, in a way, to connect you to the original article. But for Berlingske, which are planning to introduce a paywall in early 2013, this kind of copy/pasting is the worst thing they could do. They did not add anything to the story. In fact, it was just a copy of a copy. And they didn't even link to where they thought it came from. They took an article from somewhere else and disconnected it from the source. If you want to get people to pay for what you make, copied content like this is the last thing you want to associated with your brand. You have to be unique, and you have to be the creator. At this point, some might argue that this is just an example of 'freemium'. The newspaper will set up their paywall around the content they produce themselves while posting quick articles like this one for free to attract traffic. But the point about freemium is that it only works if the free content leads people to pay. It has to be a path to conversion. When people see a free article, they should get so excited about it that they feel the need to buy a subscription to get even more. Your free content is what represent you. It's the sales person you send out to greet your future audience. If that sales person doesn't provide you with any value, you won't feel compelled to say "this is useful, let me subscribe!" Creating value is not just something you do behind a paywall. Creating value is something you do everywhere. You create value through your free articles, on Your Facebook page, on Google+, on Twitter or Tumblr. You create value when you are among people at an event, and you create value even when people are not looking. Anyone can be a the bringer of news, and anyone can create a newspaper. What makes you special is not what you do, but how you do it.